** A new edition of this book is available from another publisher on Kindle and Paper. Paste this ISBN into the Amazon Search Box B00DUQB20I ***. Winnie LoPinto wrote Go Home Little Fifinella in 1944 when she returned from Sweetwater Texas. The story starts as she boards the train to Sweetwater, Texas, full of youthful enthusiasm. She vividly describes the activities at Avenger Field, the antics with the baymates of W7, the flights, the instructors, and visits by Jacqueline Cochran and General Hap Arnold. 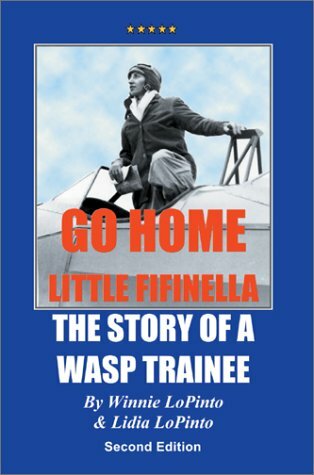 This book provides a rare glimpse into the the every-day experiences of WASP Avengerettes. YouÂ'll laugh, cry, and feel a part of that program through WinnieÂ's colorful descriptions. WASP pilots flew dangerous planes by Â"the seat of their pants,Â" with little instrumentation. Winnie was a slight woman, barely 100 pounds. Her legs didnÂ't reach the brakes and she often loosened her seatbelt to try to slide down, inside an open cabin and sometimes hanging upside down! It took a great deal of guts and skill to fly these old planes in freezing whether, but these gals did it! The WASP women were worthy and fearless pilots. Unfortunately, for political reasons revealed in this book, negative media attention of the WASP program influenced policies that affected womenÂ's rights to fly or hold other traditionally male jobs in subsequent years.